Travelling within the Philippines is costlier than travelling within Thailand. In the former, you have to take planes to get to other islands with tickets that are way too expensive for some. If you are on a tight budget, you can take a boat or other form of transportation but it's very time consuming, of course. So for those who work overseas who plan on returning home either vacation or for good, plane is the only thing we can take. But do we really know our rights as an airline passenger? I guess not. But don't worry. Be enlightened as rappler.com wrote six rights that we can exercise. If your checked-in baggage were offloaded from the flight you're in due to "operational, safety, or security reasons," the airline has to inform you ASAP, give you a report, and ensure that your offloaded baggage is carried in the next flight with available space. The airline should deliver the baggage to you within an hour from the time the flight carrying your baggage arrives at your destination. The airline must pay you P2,000 for every 24 hours that your baggage is delayed. A fraction of a day shall be considered as one day. An airline is allowed to overbook a flight -- an industry practice of selling more than the seats the aircraft has, based on demand-supply for a specific flight -- as long as the passengers who are bumped off do so voluntarily. If you volunteer to choose a different flight, the airline will offer you compensation in the form of amenities or cash incentives. If the number of volunteers is not enough to resolve the overbooking, the airline is mandated to increase the compensation package by adding more services until the required number of volunteers is met. All airlines have to outline their the limitations and restrictions in both English and Filipino. When advertising promotions, along with disclosing refund and rebooking policies, baggage allowance policies, government taxes and surcharges, other mandatory fees and charges, the airlines also have to include the number of seats offered. If you arrive within the designated check-in area at least one hour before the flight's published time of departure, you will not be considered late and the carrier is obliged to make sure you are checked in within the deadline. 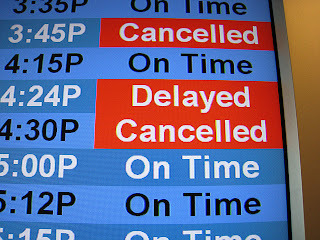 If your flight is cancelled, you have to be notified beforehand via public announcement or written notice such as through a text message. If an air carrier cancels the flight because of force majeure, safety or security reasons the passenger shall have the right to be reimbursed for the full value of the fare. In the case of delayed departures, airlines are required to provide free food, drinks, Internet access, phone use and, in extreme circumstances, hotel lodging until the flight departs. Your flight is considered cancelled if it is delayed at least 6 hours after the original departure time. You have the right to be compensated accordingly. There you go. These info will basically come in handy. And oh, one more thing. Depending on the airline, we also have a right for schedule changes. What the heck am I saying? Continue reading.. There was an instance two years ago when we booked a flight with a certain airline to fly to Singapore. The booking was made months in advance because we would like to take advantage of bargain fares that require advance purchase. However, a few weeks before we take the plunge, I got an email from the airline telling me that our departure date was moved a day late. Since our trip was scheduled during the long holiday in Thailand, changing the date was unacceptable. We have work to do, HELLO! So I sent them a reply telling them to give our money back instead. They replied back telling me to either fly to Singapore and continue the trip as planned, or lose the value of the tickets since they were promo. I phoned them and told two of their agents my story but I got the same responses as if I was reading all the messages they sent me. I immediately asked for a supervisor because the conversation was going nowhere. When the supervisor was on the other end, I carefully chose my words and controlled my temper as I was pissed with the two previous agents. To my horror, she told me the same thing. "Refund cannot be processed because it's a promo." Since I had experienced working as a travel agent/customer service rep in one of the US leading online travel sites, I somewhat learned a thing or two about this situation. I told them that as a passenger I have the right to decline whatever changes were made on my ticket. I also added that it wasn't me who made the change nor even booked the dates wrong. But here's the line that changed the course of the conversation, "I know things about the airline because I was once on the same flight with you. Meaning, I was a supervisor, too"... And she believed it. I was refunded months after.